A readable account covering Marshall's early life and education, career as a lawyer and judge, and years as the first African-American Justice on the U.S. Supreme Court. 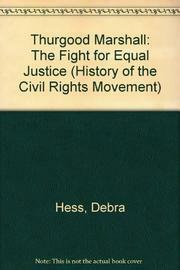 Hess uses Marshall's own words frequently, quoting (without specific citations) from periodical sources to chronicle the struggle for civil rights. A serviceable entry in the "History of the Civil Rights Movement" series. B&w photos; attractive line drawings; civil-rights time line; chronology of Marshall's life; suggested reading; sources; index.